Use two computers, logging on to one account on each. This is the recommended method. Use two browsers on the same computer (such as Firefox and Chrome). This may or may not work. Have a friend log in to your account. Do this at your own risk. Even a short session is technically against the rules, and could result in a ban on both accounts. Meet and trade. Have both avatars meet in the same location, anywhere you like. While controlling one account, right-click the other person and click "Trade." Switch to the other computer or browser and accept the trade. Arrange whichever item transfer you like. This does not have to be a two-way trade. You can give a gift from one account to another. Know the non-member limit. Ever since February 2011, the RuneScape terms of service have allowed players to transfer items between accounts. However, there is still a trade limit for certain accounts. If your account has never had a paid membership activated and was created after November 2011, it cannot transfer more than 25K worth of items or gold at once. Activating the membership once will permanently remove the trade limit, even if you let membership expire. There is no way to remove the limit without paying real money. Log on to the account that wants to get the gold. Check for a worthless item in the Grand Exchange. There must be zero of these items for sale. If there are only a few cheap ones for sale, buy them all. List one of those items for sale in the Grand Exchange. Demand a price equal to the amount you want to transfer from your other account. Log out, then log in to the account that wants to give the gold. Place a buy order for the same item and the exact same amount. The Exchange should automatically connect the two of you and make the trade.. There's a small chance that someone figures out what you're doing and places his own sell order, causing him to get your money. Place your orders quickly to reduce the chance of this happening. Avoid other sneaky methods. Do not try to use other methods of bypassing the trade limit. Most of these have been blocked as a way to fight gold farming. Dropping the items (or gold) or killing the "player" holding them may permanently destroy the loot. This includes the "table" exploit, which no longer works. Coordinating between multiple accounts to rig a minigame is against game rules. It may result in a ban. Accounts cannot give away any items or gold until the account is 24 hours old, or until the account becomes a paid member. Any items dropped will only be visible to that account. If the avatar is killed, only one of each item in the inventory will drop, including just one coin. Bots or accounts that use automated software may be banned. Anyone trading with them may be banned. Log on to both accounts. You'll probably have to use two different computers to do this. You may be able to get away with using two browsers, such as Firefox and Chrome, but this will not always work. You could get a friend to log on to one of your accounts. This is against the terms of service, and there are no protections to stop your friend stealing the account or items on it. Trade as usual. As long as both accounts are over 24 hours old (or paid members), you can trade. While controlling one avatar, right click the other and start a trade. It is impossible to transfer items between Runescape 3 and Old School Runescape. They are completely separate worlds with no way for the two to interact. If you feel trusting, you can reach an agreement with another player. Give them an item in one game, and trust that she'll give you an item in return in the other game. Except where mentioned above, this is within the RuneScape rules. However, these actions will look suspicious. This could attract unwanted attention, and lead to a ban for other behavior (botting) or a ban due to a misunderstanding. Using a bot (any third-party automation software) is against the RuneScape terms of service. Transferring items from a farming bot to a main account may alert the game moderators and lead to a ban. 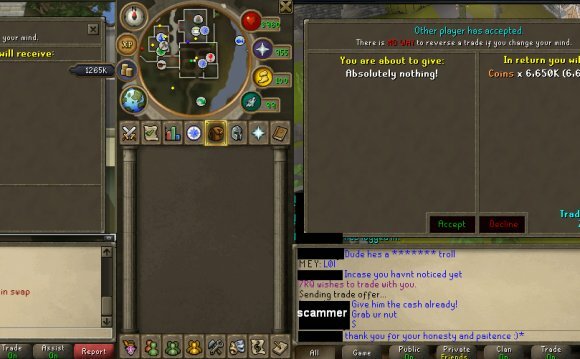 Your friend may steal your RuneScape account. Make sure you have set up some recovery questions. Change your password immediately.